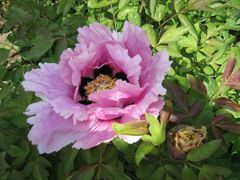 The peony (Paeonia) was adopted as the state flower by the 1957 General Assembly (Indiana Code 1-2-7). From 1931 to 1957 the zinnia was the state flower. The peony blooms the last of May and early June in various shades of red and pink and also in white; it occurs in single and double forms. No particular variety or color was designated by the General Assembly. It is cultivated widely throughout the state and is extremely popular for decorating gravesites for Memorial Day. Indiana has had a long, tumultuous history regarding state flowers, beginning with the adoption of the carnation by Concurrent Resolution in 1913. Amid protests that the carnation was a not native to Indiana, the blossom of the tulip tree was substituted as the state floral emblem by an act of the General Assembly in 1923. The interesting, but decidedly subdued tulip tree blossom gave way to the multi-talented zinnia eight years later in 1931. It was rumored that a certain grower of zinnia seeds in the state was responsible for the 1931 legislation and in 1957, the Indiana General Assembly took up the issue of an official state flower again. The following information is excerpted from the Indiana Code, Title 1, Article 2, Chapter 7, Section 1-2-7.